Pioneers in the industry, we offer Kantha Quilts such as Old Style Kantha Quilt, Handmade Kantha Quilts, Stylish Kantha Quilts, Patch Work Kantha Quilt, Fancy Design Kantha Quilt, Handmade Kantha Quilt and many more items from India. 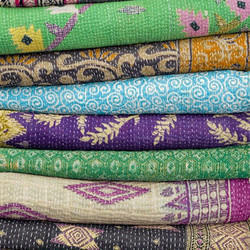 We hold expertise in manufacturing and supplying a unique collection of Stylish Kantha Quilts. 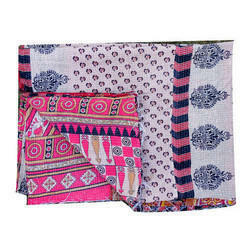 These Stylish Kantha Quilts are very comfortable to use and ideal to use for all weather conditions. Owing to its excellent softness and smooth textures, these Handmade Cotton Quilts are widely preferred by various clients. Following the demands of clients, we provide these quilts in various elegant designs, fantastic colors and alluring patterns. 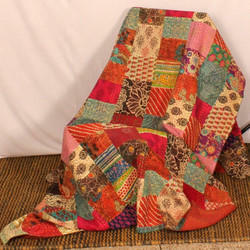 Looking for Kantha Quilts ?